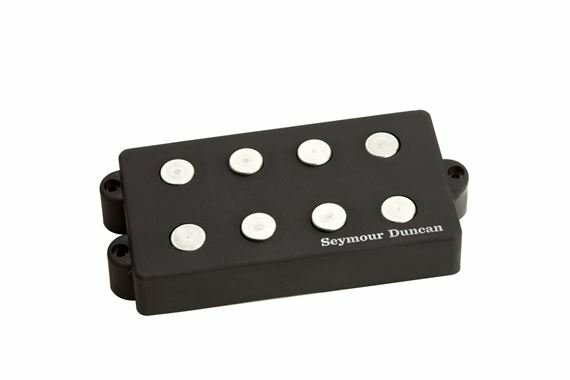 Shop Seymour Duncan SMB4D 4 String Music Man Ceramic Bass Pickup from AMS with 0% Interest Payment Plans and Free Shipping. The Seymour Duncan SMB4D 4 String Music Man Ceramic Bass Guitar Pickup is a powerful ceramic magnet pickup designed specially to bring out the best tone of the mid- and late-'70s Stingrays. This hum-cancelling pickup offers a highly musical tone contour with a richly articulated bottom, major midrange, and lots of treble. It's got a nice, mild bark without being overly brash, and it's not at all harsh in the mid-range. The low end is full and strong without being mushy or foggy. It is best used wired in parallel. Seymour Duncans are made well. I like having wiring choices. They sound clear and bright in the midrange. Lows are a bit too soft. I decided to butcher a perfectly good Jazz bass in order to make a dual humbucker Jazz. The sound and fit worked out great! They are pickups, how should they be? The PU is great. AMS had advertised the PU as being bundled WITH the tone circuit (the ad has now been changed). However, when I recieved my order I only got the PU. AMS should have eaten the cost for the tone circuit since it was their mistake. Now I have to find the tone circuit somewhere else since they don't carry it. OLP MM2 Up Grade . The quality of this thing is good . Better than the stock pickup . Well it features a better sound than the one you got on your bass . Well its a replacement for the stock pickup . So you need to know how to solder and use a screw driver . It come with instuctions to help you . Its easy to do . And even if you cant solder your self there's got to be someone close who can . So I recomend that you find that person and put this thing on your bass . For very littel money this pickup will make your bass , and everything you plug it in to , sound better....lots better . Higher output . More bottom on the E string . The high end is extended but not harsh or tinnie . And I get more of that growl that I so love .